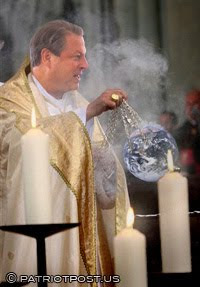 Al Gore has become more famous globally not as former US Vice President, but as the number one "crusader to save the planet" along with the UN IPCC. Their winning the 2007 Nobel Peace Prize award was a testament to such global recognition. But Al Gore is a politician, not a scientist, and that puts some question marks on him and his "science". 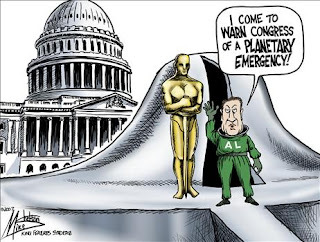 The IPCC, his main buddy for the crusade, is also not a scientific body but a governent and political body, that is why it is called the "InterGOVERNMENTAL Panel on Climate Change". Pictures here, above and below, are some cartoons and parodies about the man. These are taken from various sources in the web, not one of which originally created by me as I'm no artist nor a photoshop expert. 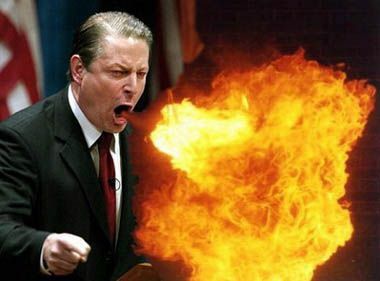 The picture was possibly used, and added the fire to reflect endless "warming planet" warnings from his mouth. As a global crusader to "save the planet", he is also pictured as an observer from the outer space who has seen the future. 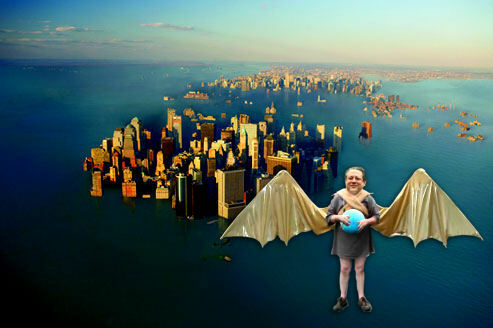 He flies to planet Earth to give the warning of "unequivocal warming" ahead of the planet's human residents. The White House is a good background as most environmental regulations that needed to "fight global warming" would need government coercion to be implemented. Ahh, the famous "rising of the ocean up to 20 feet" by the end of the century warning in his movie fiction, "An Inconvenient Truth". The IPCC made the same alarm and warning, but at a more modest scale of only 0.59 meters or about 2 feet, projected rise in global sea levels as a result of the projected melting of ice in Greenland, Antarctica and the Arctic. NYC should be submerged except the tall buildings, and the man flies as a bat to give the warning. But wait, the world is not showing any fever. It is chilling actually recently. Europe and North America are now freezing in record severe winter starting last month. 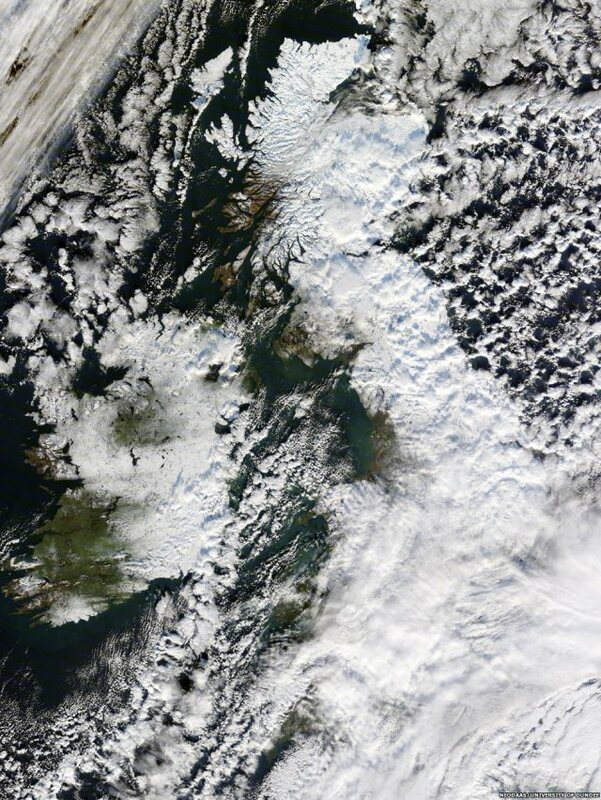 UK for instance was covered with snow, from head to toe, 100 percent, at least 2x this year. Satellite picture as of December 2, 2010. But if one will believe the UK Met and/or the BBC in their climate stories and projections, these things are not supposed to be happening because there should be more drought and less ice and snow. Ahh, this is the new picture of the man. 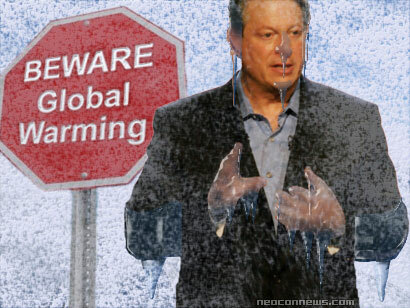 Preaching to fight global warming -- in snow and freezing temperature. 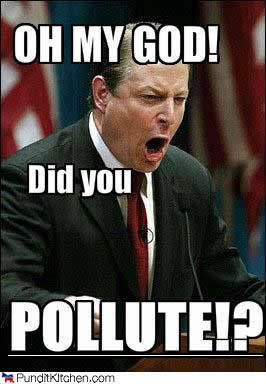 Hoorraayyy to the man and the thousands of climate warriors in Cancun, Mexico, this week until next week. Haha, nice. The cartoons, the imagery and the commentary. Josh, nice cartoon, hahaha! I will use it in my future weekend fun about Al Gore or the IPCC, thanks a lot.